Private rocket company Ad Astra is working on a propulsion system that could make future space missions more efficient. A former astronaut's rocket company is raising money via Kickstarter to make a short documentary that explains the technology behind a propulsion system that could fly people to Mars in just over a month. "Our goal is to produce a full-length video, full of stunning animations that describe the way in which we intend to use our technology to transform space transportation," Franklin Chang-Diaz, a retired NASA astronaut and the founder of the company Ad Astra, says in a video describing the Mars rocket documentary.Chang-Diaz earned a doctorate in plasma physics from MIT before he became an astronaut in 1980 and flew on seven space shuttle missions. He founded Ad Astra in 2005 to work on VASIMR, the Variable Specific Impulse Magnetoplasma Rocket. The engine uses electric power and magnetic fields to create a stream of superheated plasma with steady and efficient thrust, building up speed over time. 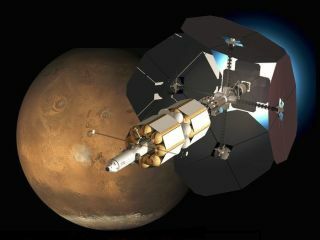 In theory it could carry a crewed mission to Mars in fewer than 40 days, advocates say. But as Ad Astra's Kickstarter video explains, VASIMR could also bring greater efficiency to missions to capture or deflect asteroids, clean up space junk or reboost orbiting outposts like the International Space Station. Ad Astra's Kickstarter campaign has gone well. With five days left, the company has already surpassed its $46,000 target, garnering more than $53,000 in pledges as of early Tuesday morning (Aug. 6).